LottoGo is a rebrand of World Lottery Club, and it looks determined to do better this time around. LottoGo retains a lot of features from World Lottery Club, like its game selections and its top-notch security. At first glance, then, it's easy to dismiss the rebranding as a simple change of logo. But there are some notable improvements here, like the expanded range of scratch cards and virtual games, as well as the commendable efforts to improve customer service. Sure, some limitations also remain, like the narrow range of payment methods and the fact that you can only bet on lottery game outcomes. Overall, though, the shift from World Lottery Club to LottoGo seems to have included new steps in the right direction. LottoGo is a solid choice, especially for new players who need more information about each lottery game. It's definitely worth a look. LottoGo is an online lottery betting site that lets players bet on the outcomes of some of the most popular lotteries around the world. Players who choose the correct winning numbers will receive the same prizes they would have, had they purchased a lottery ticket themselves. In that sense, it feels just like playing the lottery, and with LottoGo, prizes are always guaranteed. LottoGo is a lottery betting site, and works similarly to other websites that have the same business model. Players make bets by selecting number combinations from the same range as whatever lottery they’re betting on. As for winnings, LottoGo pays out all prizes, including the jackpot. They employ an insurance model to ensure that all winners receive the right prize. Decide whether you want to subscribe to draw updates. Click on the confirmation button to proceed. You can register for a free LottoGo account in under a minute. You’ll have to provide some personal information and deposit funds into your account to start playing. Click here to visit LottoGo to sign up. LottoGo is operated by Annexio Limited, an online gambling company based in the Isle of Man. 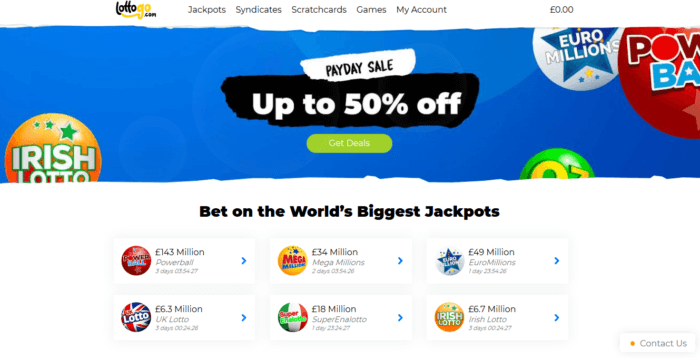 LottoGo is the 2018 rebranding of World Lottery Club, a lotto betting site that allows players to bet on the outcomes of some of the biggest American and European lotteries. Annexio Limited has offices in the Isle of Man and London. It has active licenses from the UK and Isle of Man gambling commissions, as well as the Irish National Excise License Office. If you’re looking for LottoGo promos and bonuses, look no further. Just click on the red button below. LottoGo provides awesome perks for new members. You’ll get discounted bets, free syndicate lines, and some other bonuses, simply for creating a new account. It’s a great way to dive into the service, so what are you waiting for? Limited Time Deals On LottoGo! LottoGo offers a good range of single play games. With 17 lottery games, LottoGo gives players a good range of jackpots to bet on. Blockbuster games like Euromillions and the US Powerball are here, of course, but you’ll also find less popular games like the Finnish Lotto or Irish Lotto. There are even seasonal games like El Gordo, the Spanish Christmas draw. Players who knew LottoGo in its previous life as World Lottery Club will find no surprises here. 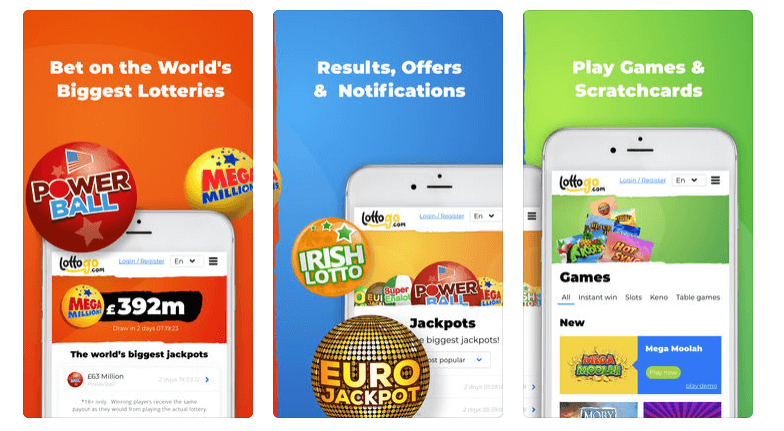 World Lottery Club — and now, LottoGo — has never been poised to compete with powerhouses like theLotter when it comes to game variety. Despite that, it’s good to see LottoGo maintain a good range with the games it does carry. I have to admit, though: it would have been nice if LottoGo took the rebranding as an opportunity to expand its game selection. LottoGo’s syndicates are affordable group play options. Like World Lottery Club, LottoGo also offers syndicates for most of its single play games. The only omissions here are the Australia Monday and Wednesday Lottos, as well as the seasonal El Gordo and El Niño games. That’s a great deal as far as value-for-money goes. If you’re not averse to group play and syndicates, the Euro Combo is one of the better ways to spend your money. LottoGo adds more scratch cards, more games, and bigger prizes to keep you busy. LottoGo has 38 virtual scratch cards that can help you, well, scratch that playing itch. These cards use the same mechanics as their analog counterparts. All you need to do is click each card’s cell to find matches. Get the right number of matches and you can claim a prize. How big are the prizes? They can go from £250 to as high as £182,500. The pot depends on your chosen game. Naturally, scratch cards with higher prizes tend to have slightly longer odds. You’ll find some surprises, though: Daily Pocket Filler, which features the biggest potential payout at £182,500, has lower odds and cheaper tickets than the Euromillions scratch cards, which top out at £150,000. I’ve got one small gripe here: LottoGo seems to have ditched the demo games that World Lottery Club used to offer for these scratch cards. Now you’ll have to buy at least 1 card to see what each game is like. If you’re more interested in casino games like blackjack and slots, you can pick from a whopping 84 games at LottoGo. 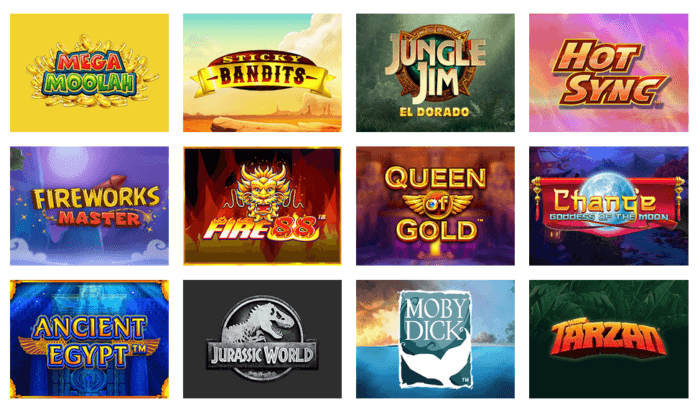 The bulk of these games — 65 in all — are virtual slot machines with different themes. All of these come with a demo, so you can get a feel for each game before betting any of your money. New members get free spins on at least one game, too. When I signed up, I got to play the Dragon Shrine slot game for free. Aside from slots, there are other games like Keno (a lottery-like game), blackjack, and roulette. Like the virtual slot games, all of these feature demos. If you’re not familiar with a game, or if you’d like to get a feel for it first, you can run a demo first. No, LottoGo is not a scam. 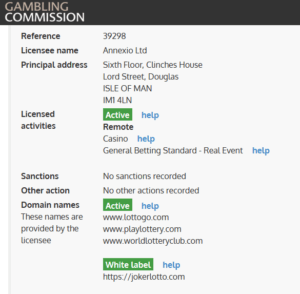 The LottoGo website boasts of licenses and oversight from the Isle of Man Gambling Supervision Commission and the UK Gambling Commission, as well as the Irish National Excise License Office. A quick check on the UK commission’s site also showed that LottoGo’s parent company, Annexio Ltd., has no records of sanctions or penalties. Plus, its licenses, including the one for LottoGo, are all up-to-date and active. Yes, LottoGo is a legitimate company and provides real opportunities to win real prizes. Yes, LottoGo has both the technological safeguards and the legal credentials to assure you of a safe, convenient playing experience. LottoGo continues to safeguard all transactions on its website using bank-grade SSL encryption. Is LottoGo a real or fake company? LottoGo is a real company with offices in both London and the Isle of Man, where they are headquartered. LottoGo is owned by the Annexio Group of Companies. Annexio Limited is licensed by the Irish National Excise Licence Office (Reference number 1012499). How does LottoGo make money? LottoGo generates profit through the sale of lottery bets and their other products. They can afford to pay out smaller prizes directly from their own pockets, while an insurance model ensures that larger prizes, like jackpots, are paid out to any winners. Absolutely. LottoGo’s operations are fully legal and regulated. The use of their service is legal as well – as long as you’re in a country/state that permits participation in online lottery betting. Does Lottery Critic trust LottoGo? Without a doubt. We at Lottery Critic have taken the time to verify LottoGo’s credentials and everything checks out. While LottoGo might not be our favorite lottery betting site, it definitely is one of the legitimate ones and you’ll have nothing to worry about when signing up for their services. LottoGo credits all winnings to your account, whether you win $10 or $10M and more. Unlike some lottery sites, LottoGo doesn’t ask you to go anywhere to claim prizes in person. Instead, your winnings go straight to your player account, regardless of how much you’ve won. If you’ve won a prize bigger than £50,000, though, you might have to wait a few days to see the money. Smaller prizes can be dispensed quickly from LottoGo’s funds, but larger sums need to be claimed from other sources. In LottoGo’s case, that means they either have to claim the money from the concerned lottery operator, or they must file a claim with their insurance provider. Either option translates to a wait of up to 40 days for you. Lucky enough to strike gold? If you win more than £10 million, LottoGo gives you an initial £10 million as the first payment. Afterwards, you’ll receive the rest of your winnings in 19 equal payments made each year. These payments will be placed in your account within 7 days of the first payment’s anniversary. 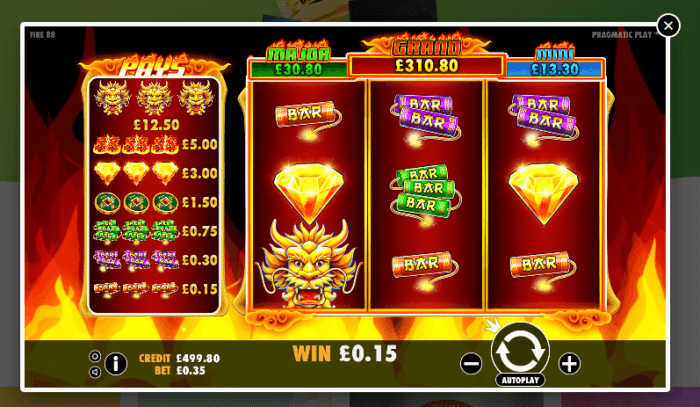 As for LottoGo’s scratch cards and virtual games, the threshold for immediate crediting is £10,000. If you win more than that, any amounts beyond £10,000 will be paid in monthly installments. It’s very easy to withdraw money from your LottoGo account into your back account. After signing into your player account using, you can go to ‘View My Account’, then ‘Account Details’, followed by ‘Withdraw’. From there, select the amount you’d like to withdraw and follow the on-screen instructions to complete the process. LottoGo gets low marks for its incredibly limited range of payment methods. Unfortunately, LottoGo only takes deposits through these payment methods: credit or debit card (Visa or MasterCard), Skrill, NETeller, international money order, or certain types of UK checks. Credit and debit cards are standard for most lottery sites, and a digital wallet like Skrill is a nice alternative. However, it would’ve been nice to have more options, especially for players where most of these payment methods aren’t a viable option. It’s worth noting that LottoGo also puts a cap of £10,000 on your monthly deposits. If you’d like to add more to your account per month, you have to contact them directly. Has anyone won on LottoGo? Yes. Although not much information on the topic is available, real people have indeed won by betting on LottoGo. Piotr Krok, a resident of Norwich UK, won £32,800 when he placed a bet on US Powerball on LottoGo. LottoGo supports an iOS mobile app, but Android users will have to stick to the LottoGo website. The LottoGo app is a great way to play on the go. Just download it from the Apple store and enjoy all the benefits of the service from your phone. You can make bets, fund your account, make withdrawals, get notified to wins, play scratch cards, and more. Android users don’t have the same option, though. Thankfully, LottoGo’s website is optimized for mobile and works with minimal issues. LottoGo seems determined to improve its customer service. As World Lottery Club, this site had unimpressive customer support. You had to dig through unhelpful FAQs to find crucial information. With LottoGo, some of that is still a problem. For example, you still need to comb through the Player Terms and Conditions for a list of accepted deposit and withdrawal methods. However, LottoGo has also expanded its FAQ section to accommodate more questions, and some of the answers now offer useful details. More importantly, LottoGo now offers live chat support. Their support team is available from 9AM – 5PM GMT, Monday to Friday. It’s far from 24/7 support, but it’s an improvement. If you happen to need help outside office hours, you can still send LottoGo’s team a support request through the chat pane or email. LottoGo claims to strive for a response time of 1 working day or less. Since the rebranding, LottoGo has also been more responsive to user comments on Trustpilot and other third-party customer review sites. Many users get a reply within days of their comment, which is a good sign. LottoGo earns two thumbs up 👍 👍 for its impressive education materials. LottoGo gives you extensive information on each game when it counts: right before you make a purchase! Each game’s page tells you how that lottery game works, how to play, and even your odds for each prize tier. There’s also a brief history of each game, including past winners. The only thing lacking is a glossary to help newbies with unfamiliar terms. Still, LottoGo’s helpful coverage of each game makes it one of the better places to start if you’re new to online lotteries. LottoGo returns fresher and easier to use than ever. World Lottery Club had a clean and simple interface. LottoGo continues that tradition while adding some design touches that make the site easier on the eyes. The differences are often subtle, but LottoGo now looks sleeker and more refreshing. The navigation remains as straightforward as ever, too, so even new members won’t get lost. The navigation bar up top lets you jump to any of the site’s key sections with one click. Likewise, you don’t have to look far to register for an account and buy tickets. However, as with World Lottery club, LottoGo still keeps some crucial links at the bottom of its website. 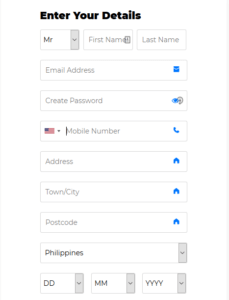 You’ll need to scroll down to find the FAQs, LottoGo’s Contact section, or even some useful articles on each lottery game’s rules and odds. Overall, though, LottoGo remains a breeze to use. Again, if you’re new to online lotteries, this is a great site for starting out: intuitive, un-intimidating, and highly responsive on any browser. Final Thoughts – Should You Use LottoGo? LottoGo improves on its previous version, World Lottery Club. If you don’t mind betting on lottery outcomes, it’s worth a shot. The LottoGo rebranding brings some welcome improvements to the website formerly known as World Lottery Club. There are some good efforts to improve customer support, more game alternatives, and so on. However, some limitations have remained, too. The biggest might be the narrow range of accepted payment methods — you can only use Visa, MasterCard, Skrill, NETeller, or certain UK checks. Aside from that, there’s LottoGo’s model itself: it’s not a lottery agent, so you’ll be betting on lottery outcomes rather than participating directly in any draws. If these issues don’t bother you, though, LottoGo is a solid website with a lot of things going for it. You’ve got secured transactions, reliable licensing credentials, a user-friendly interface, and a decent range of games. I think you should at least give LottoGo a look — though bear in mind that there could be better alternatives available. Ive been trying to cancel my registration but cant find out how to do it… been scrolling the pages even tho it says where to go… still cant find it plz help !! Hi, Mar! Do you mean cancelling your LottoGo account? To do that, you’ll need to email your request to LottoGo at support@lottogo.com. It will take at least 7 days for them to close your account. If you mean cancelling your subscription to a lottery game, you can go to the “My Games” part of your account dashboard. There should be a small Y/N switch there for subscriptions. Just click it to “N” to cancel your subscription. If you run into any more problems, you can also email support@lottogo.com for assistance.